Larry White, “Why the ‘State Theory of Money’ doesn’t explain the Coinage of Precious Metals,” Alt-M Ideas for an Alternative Monetary Future, August 24, 2017. White is essentially talking about the origins of coined money in ancient Lydia and Greece. (1) Chartalism does not have a universal theory of the origins of money (as defined as a general medium of exchange, unit of account and store of purchasing power) anymore than Neoclassical economics does. But it does have part of the story. (2) it is true that the theories of certain MMT economists who wish to argue that ancient states chose silver and gold coins only as state-issued tax-anticipation tokens ignores the subjective value that gold and silver did have for human beings. Precious metals were high prestige goods and did obtain value in the market, to some extent, by the subjective value people had for them. So, in this sense, precious metal gold and silver coins were not simply “mere tokens” for the ancients, although some important qualifications can be said about electrum coins, as we will see below. But now we turn to the flaws in White’s theory. To begin with, it is empirically wrong to assert that opposition to the Neoclassical/Austrian barter theory of the origins of money is in resurgence just because of Chartalism. In reality, anthropology had already – by the mid-20th century – presented strong evidence against the Austrian/Neoclassical theory, and modern opponents of it are not all necessarily Chartalists. “An important technical advance came with the introduction and spread of coinage in Turkey and Greece during the 7th to 5th centuries BCE. Unlike raw nuggets straight from the mine or variously refined precious-metal bars, coined pieces of silver and gold gained a major additional advantage: they became (5) uniform in size and quality, so that traders need not incur the cost of testing (or the risk of not testing) each piece for its weight and its fineness (percentage of pure silver or gold content). Early coining entrepreneurs could have profited, as later mint masters in California did, by charging for the service of converting raw silver or gold into easier-to-spend uniform coins. With the spread of coinage to India, the Middle East, and Europe, merchants found silver and gold payments easier to make and to accept. …. White is clearly asserting that coined money was invented by the private sector in ancient Lydia and Greece. But is this true? The evidence for it is feeble at best, and there is much evidence against it. The first coins were minted in the second half of the 7th century BC (650–600) in what is now western Turkey (what was called “Asia Minor” by the Classical Greeks) in ancient Ionia and within the ancient kingdom of Lydia. Both the ancient writers Xenophanes (as cited in Pollux, Onom. 9.83) and Herodotus (Histories 1.94) report this. (1) the earliest coins were made of electrum, which was a naturally occurring alloy in ancient Lydia (Kroll 2008: 17–18). The evidence shows that the Lydian kings either controlled the mines in their kingdom directly (Briant 2002: 400), and/or levied taxes on mining or extraction of metals, and indeed a certain Lydian called Pythius under the later Persian empire, who owned a number of mines in Lydia, may have been a descendant of the Lydian royal family who had inherited these mines as private family property (Briant 2002: 401). It follows that, if the Lydian kings extracted and owned much of the silver, gold and electrum (panned from the rivers), it is most probable that the kings also minted the first electrum coinage too, since a large quantity of this metal was needed. (2) that the “early coins from ancient Lydia, in what is now Turkey, were not inscribed with human faces but rather animal figures” does not provide good evidence against them having been minted by, or for, the Lydian kings: for a long time in the ancient world, coins did not carry any images of living human beings nor writing, and there is no reason why the kings would have bothered to put their images or names on the coins when people at the time knew perfectly well that they had been minted by the state. Early coins of the state mostly depicted gods, seals or other symbols. In Western civilization, one of the first kings to be depicted on coins in his own lifetime was Alexander the Great in the 4th century BC, but centuries after coins had been invented. (3) it is true that some early Lydian coins carry an inscription, apparently in the Lydian language, and refer to .WALWE. and .KALI. (Schaps 2004: 96). However, the question of who or what these names refers to is not settled at all in modern scholarship. Howgego (1995: 3) suggests that the names may be those of mints, not of individuals. And, even if they do refer to human beings, they could be individuals who minted the coins for the Lydian kings as mint masters (Wallace 1987: 393, n. 51), and this is strongly suggested by the lion symbol which appears on many such early coins, the symbol of the Lydian royal house (Schaps 2004: 96). (4) it is true we have about four coins with the Greek inscription Φάνεως ειμί σήμα, which can be translated as “I am the badge of Phanes” or “I am the sign of light.” However, as in the case of (3) above, if “I am the badge of Phanes” is the correct translation, it is unclear who this Phanes was. There is a reasonable discussion of the complexities of the issue here. Kastner (1986) points out that the name may well be that of a god, not a human being (Howgego 1995: 4). Howgego (1995: 4) speculates that even if Phanes was the name of a human being, he might have been an unknown local tyrant or ruler. So, at best, the evidence for private individuals or merchants being the driving force behind the first minting of coins is feeble. What is the case for the Lydian kings having minted the earliest electrum coins? Although it is true that some early 20th-century scholars supported the view that electrum coins were invented by the private merchants, this was strongly criticised by Cook (1958) and Kraay (1964), both of whom made the case that early coins were minted by the Lydian kings or states to pay state expenses, particularly mercenaries. Early electrum coins did not circulate much beyond the areas where they were minted, and the most common ones were of very high denomination: perhaps worth more than 10 sheep and not useful for small transactions (Cook 1958: 260). If merchants invented early electrum coins, why were they mostly useless for small ordinary commercial transactions in the market? (Schaps 2004: 97; for recent evidence on later smaller denomination coins, see Kim 2002 and Kagan 2006). R. M. Cook concluded that early electrum coins were minted by the Lydian kings in order to make large payments in a portable and durable form to people owed a large debt by the king, most probably soldiers or mercenaries (Cook 1958: 261). This view has won large-scale acceptance in modern scholarship. We can take a standard work for reference here: The Oxford Handbook of Greek and Roman Coinage (Oxford and New York, 2012). In this work, Kroll (2012: 44) concludes electrum coins were created by the kings of Lydia. The view is held by Wallace (1987: 386), Osborne (1996: 256), Kim (2001: 10), Whitley (2001: 193), Hornblower et al. (2014: 182), Freeman (2004: 185), and Howgego (1995: 3, noting that no certain evidence in all of antiquity for coins being produced by private individuals). There are a few dissenters like Holloway (1978), but their arguments, as can be seen from the scant evidence above, are weak. And, while both Schaps (2004: 100) and Seaford (2004: 133) allow some role for private individuals, both concede a large role for the Lydian state in driving the process and being the impetus for it. Notably, while these early electrum coins had a surprisingly near uniform weight, they were actually variable in their metallic content, and the proportion of gold to silver varied in these coins: for example, one study has found that the silver content of the electrum coins could range from 20% to 75%, which reflected the natural variability of the electrum alloy itself, or even further dilution with extra silver (Wallace 1987: 386). The near uniform weight but variable metal content of the electrum coins is an important datum. It would have been very difficult for the public to test the true metal content of early electrum coins (Wallace 1987: 392), or indeed small bits of electrum or electrum dust (Kroll 2008: 18). The great difficulty in ascertaining the gold to silver content and metallic value of electrum even before it was coined is actually good evidence against the Mengerian/Neoclassical explanation of its emergence as money. Given the variable metal content of electrum and difficulties of assessing its value, one cannot easily argue that early merchants invented electrum coins as standardised money with consistent gold and silver value as the most saleable medium of exchange. Rather, various scholars (see Wallace 1987: 393, Kroll 2012: 44) concluded that the Lydian kings invented electrum coins as a way of standardising the value of individual issues of electrum (despite the variability of the gold to silver content in the coins) by means of a royal seal on the coin, so that this would stabilise their value by accepting the coins back at the same value, presumably as taxes, fines or payments due to the government. That is to say, the royal stamp was a sign of redeemability at a fixed value (Seaford 2004: 133; Osborne 1996: 256). In the sense that value was not always equal to the metallic content of the coins, electrum coins were fiduciary and state-guaranteed money (Wallace 1987: 393). These points count against electrum coinage having been an invention of the private sector, because, as we have seen, the difficulty of ascertaining the gold or silver content of electrum coins, or earlier small electrum portions or electrum dust, does not suggest electrum was the most saleable commodity that emerged as money by the barter spot trade. Instead, it was a royal government that selected electrum as a state-guaranteed money or form of payment, and that could overcome people’s concerns about the actual metal content of the coins by fixing value. Cook, R. M. 1958. “Speculation on the Origins of Coinage,” Historia 7: 257–262. Freeman, Charles. 2004. Egypt, Greece and Rome: Civilizations of the Ancient Mediterranean. Oxford University Press, Oxford. Hall, Jonathan M. 2007. A History of the Archaic Greek World, ca. 1200–479 BCE. Blackwell Publishing, Malden, Mass. Harris, W. V. (ed.). 2008. The Monetary Systems of the Greeks and Romans. Oxford University Press, Oxford and New York. Holloway, R. Ross. 1978. “La ricerca attuale sull’origine della moneta,” Rivista italiana di numismatica e scienze affini 80: 7–14. Hornblower, Simon, Spawforth, Antony and Esther Eidinow (eds.). 2014. Oxford Companion to Classical Civilization. Oxford University Press, New York. Howgego, Christopher J. 1995. Ancient History from Coins. Routledge, London. Kastner, Wolfgang. 1986. “‘Phanes’ oder ‘Phano’,” Schiunzerische Numismatische Rundschau 65: 5–11. Kim, H. S. 2001. “Archaic Coinage as Evidence for the Use of Money,” in Andrew Meadows and Kirsty Shipton (eds.). Money and its Uses in the Ancient Greek World. Oxford University Press, Oxford. 7–21. Kim, H. S. 2002. “Small Change and the Moneyed Economy,” in P. Cartledge, E. E. Cohen and L. Foxhall (eds. ), Money, Labour and Land. Approaches to the Economies of Ancient Greece. Routledge, London and New York. 52–66. Kroll, J. H. 2008. “The Monetary Use of Weighted Bullion in Archaic Greece,” in W. V. Harris (ed.) The Monetary Systems of the Greeks and Romans. Oxford University Press, Oxford and New York. 12–37. Kroll, John H. 2012. “The Monetary Background of Early Coinage,” in William E. Metcalf (ed. ), The Oxford Handbook of Greek and Roman Coinage. Oxford University Press, Oxford and New York. Osborne, Robin. 1996. Greece in the Making, 1200–479 BC. Routledge, Abindon. Peacock, Mark. 2013. Introducing Money. Routledge, London. Price, Martin Jessop. 1983. “Thoughts on the Beginnings of Coinage,” in C. N. L. Brooke et al., Studies in Numismatic Method Presented to Philip Grierson. Cambridge University Press, Cambridge. 1–10. Schaps, D. M. 2004. The Invention of Coinage and the Monetization of Ancient Greece. University of Michigan Press, Ann Arbor. Wallace, Robert W. 1987. “The Origin of Electrum Coinage,” American Journal of Archaeology 91.3: 385–397. Whitley, James. 2001. The Archaeology of Ancient Greece. Cambridge University Press, Cambridge. James Keir Hardie (15 August 1856–26 September 1915) was the founder of the British Labour Party (which was founded on 27 February, 1900), its first leader, and its first Member of Parliament. 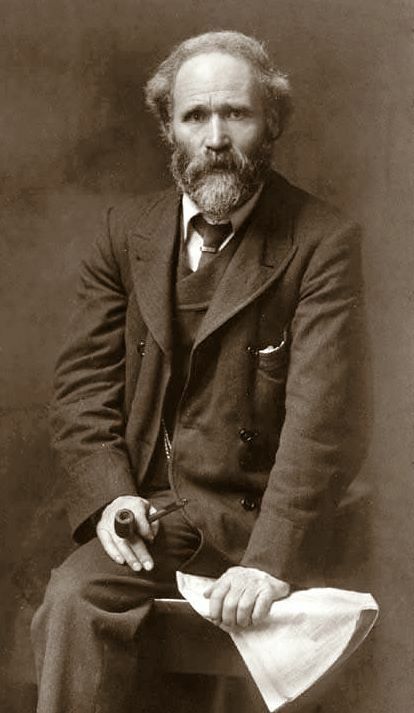 In 1899, James Keir Hardie appeared before the UK House of Commons Select Committee on emigration and immigration. “James Keir Hardie, Secretary to the Ayrshire Miners’ Union and to the Scottish Parliamentary Labour Party (pp. 63–69) stated that 2,500 foreign workmen were employed in Glasgow, 300 in Leith and 20 at the Glengarock Ironworks in Ayrshire. There were between 2,800 and 3,000 foreigners in Scotland altogether. …. In many cases, they only stayed in Scotland a few months, to earn sufficient money to pay their passage to America. Their willingness to accept lower wages to achieve this end gave rise to sweated labour. Complaints were made to Mr. Hardie by the workers at Glengarnock about the reduction in their wages which had been 17 shillings a week, but since the introduction of foreigners, had been reduced to 12 shillings. Speaking of the Poles at Glengarnock, he said ‘their habits are very filthy, six or seven males occupying a one-roomed house, and having women to cook for them’ (para. 1426). There was much ill-feeling between them and the Scottish workers. The more you look into it, the more you will discover that the pre-1960s Socialist and Old Labour left was often very hostile to the idea of open borders and mass immigration. Their views were often strongly at variance with the opinions of people who now pass for the “Left” in the Western world. As we have seen here, here, and here, the heavily Marxist Socialist Party of America supported immigration restriction legislation and was even more vehement than Hardie in opposing open borders. There is a whole history that could be written on the pre-1960s Left and to what extent and why it was hostile to mass immigration, but you can bet the unhinged lunatics and charlatans who pass for the modern “Left” will be completely uninterested in this. Given the enthusiasm of the modern Left for the quasi-Maoist cultural destruction of the past of the Western world, they’d better start with taking down and destroying all statues, busts, photos, and memorials to James Keir Hardie, in view of his politically incorrect opinions. See also his book: Bowles, Samuel and Herbert Gintis. 2011. A Cooperative Species: Human Reciprocity and its Evolution. Princeton University Press, Oxford and Princeton, NJ. Breitbart has an eyebrow-raising article here on early American socialists and their attitudes to race. First of all, it is true enough that many early socialists, Liberals and even some Marxists did believe in the biological reality of race and racial differences. We know that Karl Marx at the end of his life seems to have believed in the reality of races, and even in a kind of racial phrenology and the racial pseudo-science of Pierre Trémaux (1818–1895) on racial degeneration. “The superior development of Aryans and Semites is, perhaps, attributable to the copious meat and milk diet of both races, more especially to the favorable influence of such food on the growth of children. As a matter of fact, the Pueblo Indians of New Mexico who live on an almost purely vegetarian diet, have a smaller brain than the Indians in the lower stage of barbarism who eat more meat and fish.” (Engels 1909: 32). I cannot verify the statements made in Breitbart about the American Marxist Victor Berger, who supposedly said that “There can be no doubt that the negroes and mulattoes constitute a lower race—that the Caucasian and indeed the Mongolian have the start of them in civilization by many thousand years,” though this statement is quoted in scholarly secondary literature as having been said by him. But what can be said is that, even if they held them, in their opposition to, say, immigration these American socialists/Marxists like Victor Berger did not invoke such racial views, as can be conclusively seen in the public statements and resolutions of the Socialist Party of America here, here, here, of which Victor Berger was a prominent member. In reality, these socialists argued against mass immigration on pragmatic economic and social grounds, but did allow immigration of people suffering persecution, and did not call for immigration exclusion of people on the basis simply of their race. But to return to the general point: as the author of the Breitbart article points out, must all the statues and monuments to socialists, Marxists and Karl Marx and Friedrich Engels be pulled down too, because of their racial views? If not, why not? A secondary point is: are all these other accusations about early socialists in Breitbart accurate? The article seems to imply that the newspaper Appeal to Reason (which existed from 1895 to 1922 and which became a leading socialist publication after 1901) supported some kind of state-enforced racial discrimination and forced segregation of blacks. Is this true? Breitbart seems to be referring to a book called Leaves of Life: A Story of Twenty Years of Socialist Agitation (Girard, Kansas, 1912) by Julius Augustus Wayland, a radical American socialist who had founded Appeal to Reason in 1895, and who published the writings of other leading socialists like Jack London, Mary Harris Jones (“Mother” Jones), Upton Sinclair and Eugene Debs. Socialism will solve the race question, and that, too, without a single reference to race and without denying to any person a single right accorded any other person. It will be done in just the way the government or society now employs colored soldiers or provides schools for them separate from the whites. Take, for instance, some great factory. The workers will make the regulations, governing the industry. It would require a majority of the workers to consent to the employment of colored, Chinese, or any other race in that particular factory, a consent not likely to be given. As every citizen would have the right of employment, a rejection of any race would necessitate the erection of a plant of that or some other character in which such colored citizens would be separated from the whites and the whites from the colored people, one not more than the other. The colored race would have the same right to reject or accept the association of whites. It would be to the interest of all to have the colored race furnished with the same good machinery to work with and the same good homes and schools and everything, as the result of their labor would be a matter of interest to all. Thus they would live as well as the whites and have every surrounding to develop and unfold them that could be placed about them. There would be communities or sections of blacks, of Chinese, or of any other races and nationalities, if there were such citizens. You might fear that such guarantee of employment and capital by the public would result in flooding this country with the hordes from other lands. Yes, if a majority of the people here should vote to admit them. But that is not likely. You see the public would own all the land, machinery and means of exchange, and no one could find a place to work, except the majority should make regulations admitting them. They come in now by the millions, with or without your consent, because the private owners of industries can hire them cheaper than you want to work for. You would need the anti-Chinese laws and other farces then. No, Chinamen might come, but Chinamen would not be able to work and live here without your consent. Thus you see that private ownership of industries mixes up the races, reducing blacks, whites and yellows to a common level, while socialism would separate the races and lift them all to the highest level of which each were capable. It would do this without denying one any right possessed by another, without denying employment to any class, and without permitting any to take profit off another. All the hell you see in the fields of industry today, all the riots, strikes and threatened revolution are the results of private ownership, where should be public ownership. All is the result of one set trying to squeeze profit out of the other in some industry. When you get wise you will abolish this hell and institute a heaven.” (Wayland 1912: 128–130). A careful reading of this passage shows it doesn’t support the idea that Julius Augustus Wayland advocated some kind of state-enforced racial discrimination to oppress blacks, nor universal state-forced segregation of blacks. Rather, the socialist world imagined by Wayland supported some kind of democratic and voluntary association and integration or voluntary separation, in accordance with the mutual wishes of workers and communities. That might sound harsh by modern standards, but it’s hardly the picture strongly implied by Breitbart. Of course, the passage does show that, in Wayland’s view, ordinary American white workers probably would not have wanted to be integrated with other races, but that is a commentary on the general social attitudes and general racial feelings in early 20th century America, not on the socialist system Wayland advocated per se. “Socialism will solve the race question, and that, too, without a single reference to race and without denying to any person a single right accorded any other person. …. As every citizen would have the right of employment, a rejection of any race would necessitate the erection of a plant of that or some other character in which such colored citizens would be separated from the whites and the whites from the colored people, one not more than the other. The colored race would have the same right to reject or accept the association of whites. …. socialism …. would do this without denying one any right possessed by another, without denying employment to any class, and without permitting any to take profit off another.” (Wayland 1912: 128–130). “You might fear that such guarantee of employment and capital by the public would result in flooding this country with the hordes from other lands. Yes, if a majority of the people here should vote to admit them. But that is not likely. You see the public would own all the land, machinery and means of exchange, and no one could find a place to work, except the majority should make regulations admitting them. They come in now by the millions, with or without your consent, because the private owners of industries can hire them cheaper than you want to work for. You would need the anti-Chinese laws and other farces then. No, Chinamen might come, but Chinamen would not be able to work and live here without your consent. Thus you see that private ownership of industries mixes up the races, reducing blacks, whites and yellows to a common level, while socialism would separate the races and lift them all to the highest level of which each were capable.” (Wayland 1912: 128–130). But, as we have seen from the context of the whole passage, Wayland thought that separation would be democratic and voluntary, and – whatever you think about the morality of any of this – Wayland’s views were not as extreme and sinister as the way they were portrayed by Breitbart. Wayland, Julius Augustus. 1912. Leaves of Life: A Story of Twenty Years of Socialist Agitation. Appeal to Reason, Girard, Kansas. In essence, if there was any doubt at all that the Cultural Left has massive ideological control of popular social media like YouTube and tech companies like Google, then there can be no doubt now. I had my differences with Sargon on economics and his feeble “Classical Liberal” world-view, but he did heroic work exposing SJW lies and insanity, and these social media purges and Orwellian censorship are ominous signs. The BBC produced a cartoon as part of their “The Story of Britain” series called “Roman Britain”. But why on earth is a person who appears to be a sub-Saharan African (or possibly an indigenous North African) being depicted as a head of a “typical family” in Roman Britain? To be “typical,” this entails that this is what the average family looked like, whether of Roman personnel in Britain or of all people in Roman Britain generally, and that in turn entails that the majority of Roman personnel or the majority of all people in Roman Britain were sub-Saharan Africans or indigenous North Africans. Such an idea is, of course, outrageously nonsensical. 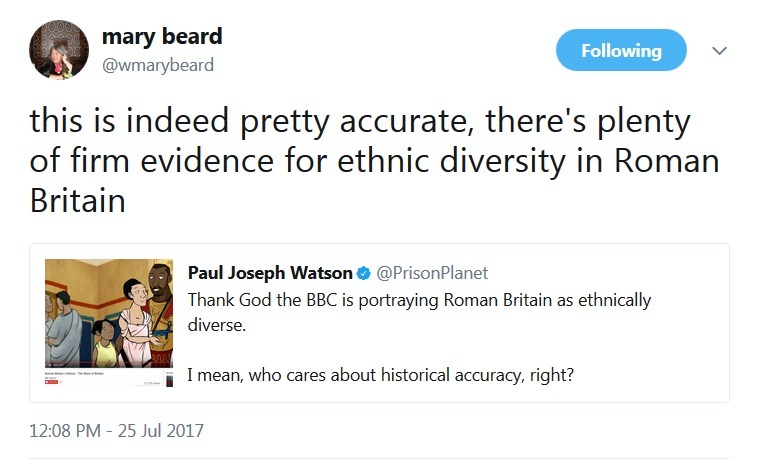 And citing evidence of some few sub-Saharan Africans or indigenous North Africans in Britain cannot possibly prove that the majority of Roman personnel or the majority of all people in Roman Britain were of that ethnic identity. The British Classicist Mary Beard defended the BBC in various Tweets on Twitter and in this TLS article here. So what was the meaning of this Tweet? Was Mary Beard suggesting that a family headed by a sub-Saharan African or indigenous North African was a “typical family” in Roman Britain and the majority of people were like this? A review of her Twitter feed and the TLS article here (see also here) shows that Beard quickly tried to oppose the criticisms of her Tweet by saying her defence only meant that the idea that a Roman family headed by a black man in Britain was “possible,” or that there is some evidence of low-level ethnic diversity in Roman Britain (neither of which reasonable people dispute). Mary Beard also suggested that the black man was “loosely based …on Quintus Lollius Urbicus, a man from what is now Algeria, who became governor of Britain,” even though Quintus Lollius Urbicus was a North African Berber, and the idea that Berber families were “typical” of Roman Britain is also laughable. The main issue that critics of the cartoon were pointing to is this: how can a family headed by a sub-Saharan African (or possibly an indigenous North African) possibly have been a “typical family” in Roman Britain, when that requires that most people were like this? Instead of honestly answering this question, the social media debate quickly got side-tracked into secondary issues, such as whether there was ethnic diversity and foreigners in Roman Britain at all (and clearly there was some kind of low-level ethnic diversity on Roman Britain). Well, maybe there are such people, but I’ve yet to see one. Well, well, well. It’s almost like the BBC realise their original description was absurd. But can modern classicists admit this too? Can Mary Beard admit this? And note well: this was the major issue that critics of the BBC had, and all other points are secondary or minor. But – be that as it may – let us now turn to some minor issues. In the various Twitter debates, there was discussion of a passage in an ancient Latin source called the Historia Augusta, a series of imperial biographies probably written in the late 4th or early 5th century BC. In this work, there is a biography of the emperor Septimius Severus, who ruled from 14 April 193 to 4 February 211, and he died in Eboracum (York) in Britain. This biography describes the last years of Severus’ life when he was on campaign in Britain, and troubled by omens of his own death. A passage from Severus’ biography was used by Beard in her TLS article here to prove that there were blacks in Roman Britain. Apart from minor textual issues easily resolved, the Latin of the crucial highlighted part, with its correlative conjunction “et ... et” construction, is clear enough: et coloris eius tactus omine et coronae. Assuming that the story is even real (and the major modern biographer of Severus raises doubts: see Birley 1988: 184), what does this story prove? It certainly does not prove that the majority of Roman personnel in Britain were sub-Saharan Africans. And the context of the passage suggests that seeing a black man in the British army was an unusual sight, because if sub-Saharan Africans were common and in large numbers in Britain, then why would Severus have been surprised or startled to meet one? The passage also shows that the Romans had a superstitious fear of black skin, because black was regarded as an ill-omened colour (Snowden 2001: 260). Even worse, we have evidence of another episode like this that occurred in 42 BC before the second battle of Philippi in the army of Marcus Junius Brutus. “48.1. On that night, they say, the phantom visited Brutus again, manifesting the same appearance as before, but went away without a word. 2. Publius Volumnius, however, a philosopher, and a companion of Brutus in all his campaigns, makes no mention of this omen, but says that the foremost standard was covered with bees; …. 4. He says also that just before the battle itself two eagles fought a pitched battle with one another in the space between the camps, and as all were gazing at them, while an incredible silence reigned over the plain, the eagle towards Brutus gave up the fight and fled. 5. And the story of the Ethiopian is well known, who, as the gate of the camp was thrown open, met the standard-bearer, and was cut to pieces by the soldiers, because they thought [him] an omen.” (ὁ δ᾽ Αἰθίοψ περιβόητος γέγονεν, ὁ τῆς πύλης ἀνοιχθείσης ἀπαντήσας τῷ φέροντι τὸν ἀετὸν καὶ κατακοπεὶς ταῖς μαχαίραις ὑπὸ τῶν στρατιωτῶν οἰωνισαμένων). The same story is recorded by the ancient historians Appian (The Civil Wars 4.17.134) and Florus (Epitome of Roman History 2.17.7.7–8). Both of the passages above suggest that your average Roman solider was so superstitious that the sight of a black man before some crucial moment (like a battle) was considered a terribly bad omen. In fact, in the case of the soldiers of Brutus, the soldiers slaughtered the poor African man on the spot in a murderous assault. So why, then, would Romans import large numbers of sub-Saharan Africans into their armies if they were so superstitious? Such evidence suggests that blacks in general were likely to have been a tiny minority in the Roman army, and not common at all. And yet Anthony Birley – the major scholarly biographer of the emperor Septimius Severus – established that Septimius Severus was descended from Roman Italian colonists in north Africa on his mother’s side and wealthy Punic (or Punic-Libyan) magnates in Leptis Magna on his father’s side (see Birley 1988: 8, 212–226; see here). This means that, at most, Septimius Severus would have had swarthy skin like the southern Italians or the native people of North Africa. It is absurd to claim that Septimius Severus would have had black skin like sub-Saharan Africans. We also have portrait statues of Septimius Severus, and he does not look like a sub-Saharan African. Thus Mary Beard – if she bothered to read Anthony Birley’s Septimius Severus: The African Emperor (1988; rev. edn. 1999) – was being straightforwardly disingenuous when she asserted that “Even in the case of Septimius Severus, the first Roman emperor from Africa (Libya), we don’t actually know the colour of his skin, how far he was ‘native’, how far the descendent of Italian settler.” The genealogy established by modern research, however, does allow us to talk about Severus’ ancestry with reasonable confidence, and his skin colour. Birley, Anthony. 1988. The African Emperor: Septimius Severus (rev. edn.). B. T. Batsford, London. Snowden, Frank M. 2001. “Attitudes towards Blacks in the Greek and Roman World: Misinterpretations of the Evidence,” in Edwin M. Yamauchi (ed. ), Africa and Africans in Antiquity. Michigan State University Press, East Lansing. 246–275. Starks, John H., Jr. 2011. “Was Black Beautiful in Vandal Africa?,” in Daniel Orrells, Gurminder K. Bhambra, and Tessa Roynton (eds. ), African Athena: New Agendas. Oxford University Press, Oxford. 239–257. I have updated my chronology of human evolutionary prehistory and early history to complement my summaries of Gregory Cochran and Henry Harpending’s The 10,000 Year Explosion: How Civilization Accelerated Human Evolution (2009). (ii) Austro-Tai including Austronesian and Tai-Kadai (e.g., Thai and Lao; see map here). c. 4,000–3,000 BC – beginning of migrations of the Austronesian-speaking people from Taiwan to the Philippines, Borneo, Indonesia and the Pacific islands (see map here). c. 3,000 BC – Akkadians migrate into northern Babylonia? c. 2,115 BC – conquest of Akkad by the Guti? c. 2,000–900 BC – the Andronovo culture, a Bronze Age culture in western Siberia and the west Asiatic steppe; the culture of the Indo-Iranians; Andronovo culture gave rise to the Saka (Scythians), Sarmatians and Alans. c. 800 BC – Iranian speakers who became the Medes and Persians migrate into Iran?